Can you find the sunken treasure? For goodness’ sake, CLICK TO ENLARGE. This gorgeous bathymetric map of Lake Huron clearly shows the Alpena-Amberley Ridge, which once cut straight across the lake. Evidence of ancient hunting sites have been found along the now-submerged ridge. The USA Today article reports that 9,000 years ago, water levels in Lake Huron were about 76 meters (250 feet) lower than they are today. The shallower lake exposed a hilly ridge where ancient Native Americans hunted caribou. Why were water levels so much lower? 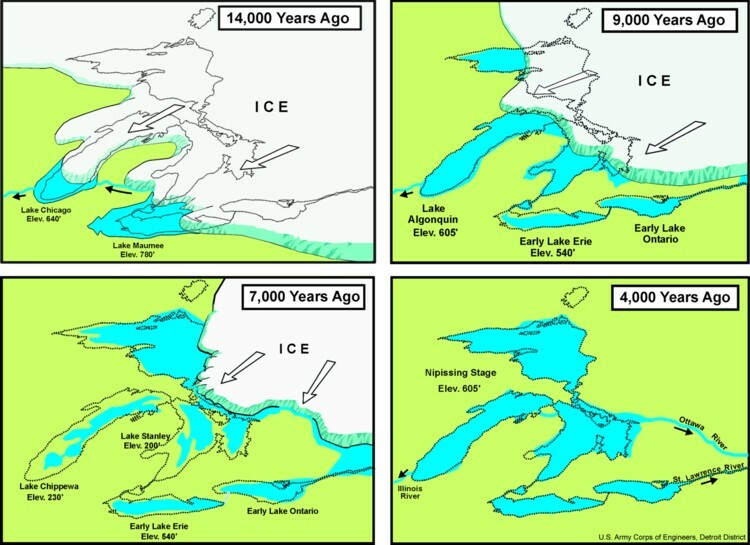 During the Ice Age, the Great Lakes were much less great! Although most geologists think glaciation had created lake basins much earlier, prior to the melting of the great Laurentide Ice Sheet, their water levels were much lower. Our comprehensive encyclopedic entry on archaeology defines two types of materials studied by archaeologists: artifacts and features. Did the archaeologists studying the site in Lake Huron discover artifacts or features? Features are big, heavy, non-portable remains, such as pyramids and post-holes. Features discovered at the Lake Huron site include boulders used as hunting blinds. 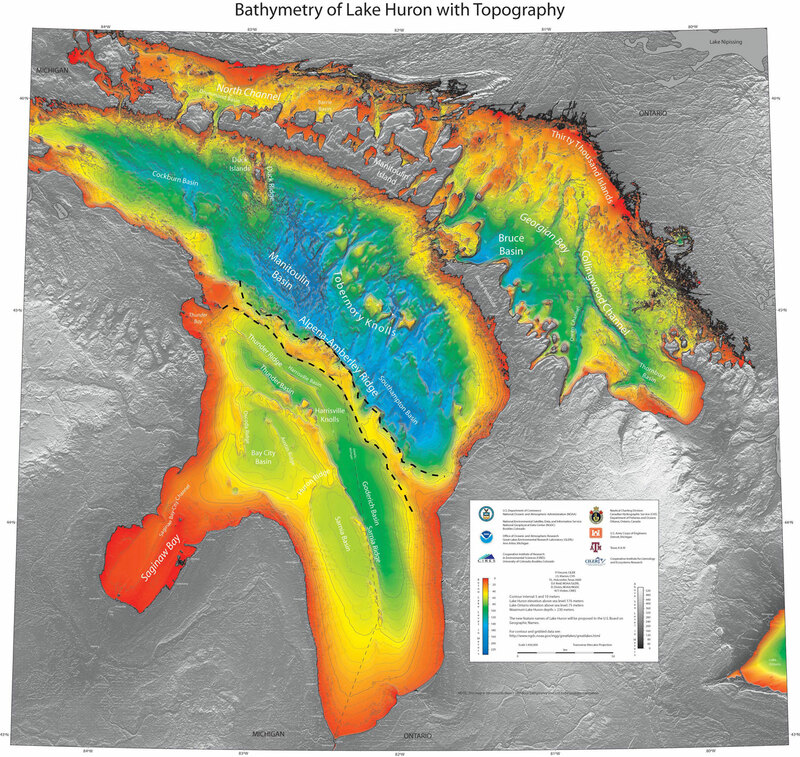 Take a look at the spectacular bathymetric map of Lake Huron above. The archaeologists profiled the USA Today article found their artifacts and features on the Alpena-Amberley Ridge, which clearly cuts straight across southern Lake Huron. Where else in Lake Huron would you look for evidence of ancient cultures? Where wouldn’t you look? Archaeologists would probably look for artifacts and features in the shallower parts of Lake Huron—less than 76 meters (250 feet) deep. These regions would have been dry land (or at least swampy) during the last ice age and may contain evidence of ancient Native American culture. The deeper parts of Lake Huron would probably not hold evidence of ancient cultures. Manitoulin Basin, Cockburn Basin, and Bruce Basin would probably not be good places to excavate. Play our underwater archaeology game, “Find the Sunken Treasure.” The tool digital underwater archaeologists use in the game is a gradiometer. Do you think the archaeologists studying Lake Huron used a gradiometer? Why or why not? Lakes are just one place underwater archaeologists look for evidence of ancient cultures. Where else do you think underwater archaeologists look? What do you think they find? rivers. These archaeologists are excavating a site in Minnesota’s Granite River, looking for artifacts from historic trade routes. cenotes. This explorer explores the “sacred geography” of Mexico’s natural sinkholes and underwater caves for evidence of the ancient Maya. tidal basins. These archaeologists have discovered ingenious, ancient Native American fish traps in a tidal basin along the western Canadian coast. springs. Archaeologists have been studying Jerusalem’s Gihon Spring for almost as long as there has been a Jerusalem! seas. Ancient shipwrecks have provided Robert Ballard and other rock-star undersea explorers with evidence for a thriving ancient trade network in the Black Sea. the ocean, of course!!! Speaking of Robert Ballard . . . Thanks as always to Sam, one of our very favorite geographers, for the heads-up on this great current-event connection! Amazing. Thanks for sharing this, Peggy! Love reading about this type information. Wonder if that is why ATLANTIS is so difficult to find.? >>Why were water levels so much lower? It was the tail end of the Ice Age, or last glacial period. Water levels in Lake Huron (and every other body of water on Earth!) were much lower because so much water was trapped in massive glaciers. Not true. That is true for sea levels, but not of lake levels. AFAIK, the Great Lakes were of varying levels because a) the ice backed up to higher levels by not allowing outlets to the north or east, b) when those collapsed, lakes disappeared or were much reduced (Lake Agassiz into much smaller Lake Manitoba) , and c) the tilt of either down tilt in the south or much greater up tilt of the north due to surge from former depression. The last is key to Huron being of lower elevation. It had a means to flow out due east, but now has to go through Sarnia and Lake Erie and go over Niagara Falls. The pass due east has risen over the last 13 thousand years many meters, and for quite a few thousand years the easiest method for water is to flow south. >>northern Georgian Bay, Barrie Basin, or Sarnia Basin (which would have likely been a flat plain 9,000 years ago). According to the above map, northern Georgia Bay would have been deep under the ice then and Sarnia Basin would have been even deeper under the water instead of a plain since the outlet would have to go through Chicago River region with the ice sheet still blocking the northern route. Sarnia Basin was depressed since the rebound would have not risen as far as is the case now. >> Why or why not? No, they probably didn’t use a gradiometer. A gradiometer measures evidence of metal. The Lake Huron site is a Stone Age site. The tools used by ancient Native Americans at the site were mostly stone, not metal. I am not so sure. While metal should be unusual, it also might be far easier to detect. And copper is still found commonly though out the drift regions hundreds of kilometers to the south of the copper producing area of southern Lake Superior. Without trees, humus or lichens (like some parts of Iceland have extensive plains between oasis grassland), the bright, shining yellow would attract notice and might be seen miles away in the low angled sun if on the surface, especially on a flat plain. Trade networks often went a thousand kilometers or more (e.g. products from Cactus Hill, Virginia) and a bright shiny metal would likely become a valued item. Also, there are the iron mining areas near Lake Superior. Clinking rocks of strange sound is yet another value, as well as possibly with knives. For example, the Eskimos (they might prefer the term Greenlander, although different from the main type of the super island) of Etah region hiked a great distance of hundreds of km to the famed Cape York meteor. There they managed to cut off pieces and make crude knives out of them. Meteors and natural deposits would mean some items to move the gradiometer. And since the strand of isthmus was naturally very thin a places, the campsites and caches might be natural concentration points on a trade route. Think about it. We shall see. All in all, a good site and wonderful bathymetric map of Huron. I understand this is for young adults and not peer reviewed, so please keep trying. But students, keep in mind that everyone makes mistakes. However much a generalist one may be, no one is an expert in all of science. Previous Previous post: Vampire Therapy?